Lowest prices all the time, guaranteed! If you find a better price, let us know. Garden Dream Quilt bedding by C & F Enterprises has bands of vintage inspired floral prints in pinks and sage green accented by rows of small ruffles. Bring the garden into your bedroom and enjoy garden dreams. The bedskirt, valance, and euro shams are offered in a pink and sage stripe. Coordinating throw pillows add more florals to the mix. 100% cotton and machine washable on gentle. Vintage inspired floral prints in pinks and sage green accented by rows of small ruffles. Cotton Filled, Prewashed, Luxury Oversized. 66" x 86". We offer the complete ensemble in the Garden Dream pattern by C & F.
Bands of vintage inspired floral prints in pinks and sage green accented by rows of small ruffles. Cotton Filled, Prewashed, Luxury Oversized. 90" x 92". Fits full and queen size mattresses. We offer the complete ensemble in the Garden Dream pattern by C & F.
Bands of vintage inspired floral prints in pinks and sage green accented by rows of small ruffles. Cotton Filled, Prewashed, Luxury Oversized. 108" x 92". We offer the complete ensemble in the Garden Dream pattern by C & F.
Bands of vintage inspired floral prints in pinks and sage green accented by rows of small ruffles. 20" x 26". We offer the complete ensemble in the Garden Dream pattern by C & F.
26" x 26" euro sham in Pink & Sage Stripes. 100% cotton. Ruffled edge. By C & F Enterprises. Allow approx. 3 weeks delivery on this item. Neckroll pillow in vintage inspired floral prints with ruffled ends. 6" x 12". We offer the complete ensemble in the Garden Dream pattern by C & F.
Bands of ruffles in vintage inspired floral prints on a 16" x 16". 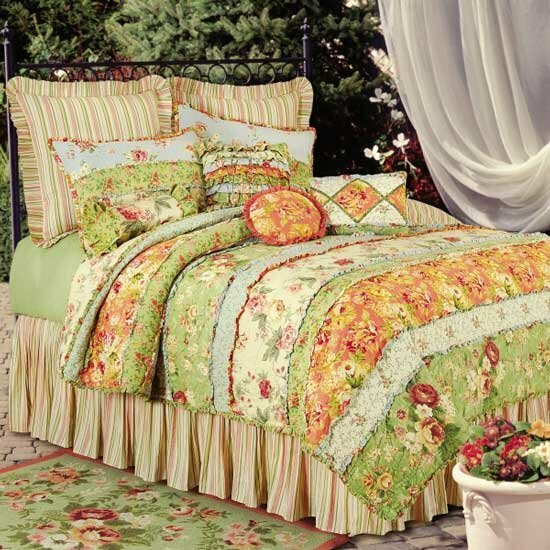 We offer the complete ensemble in the Garden Dream pattern by C & F.